Area 4: Download a printable PDF version of this map. Area 104: Download a printable PDF version of this map. Crab 4,104 Reminder Combined daily limit for Dungeness crab, red rock crab, box crab, Puget Sound king crab and all other king crab is 6. Porpoise Harbour and Wainwright Basin Crab Closed Area Closed That portion of Subarea 4-11 west of the Highway #16 bridge at Galloway Rapids, which includes Wainwright Basin, Porpoise Harbour, and Porpoise Channel. 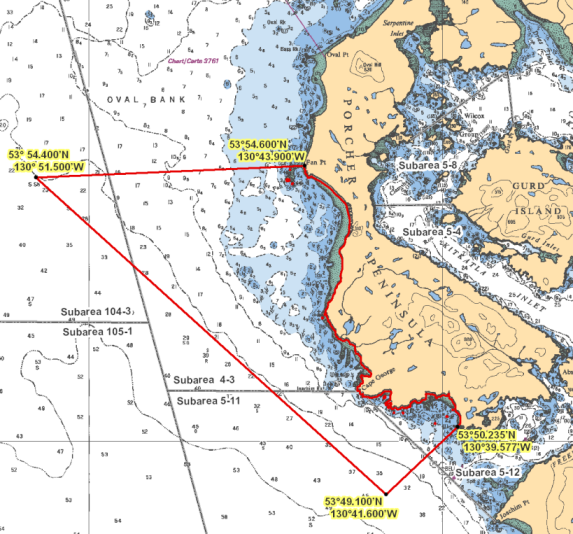 That portion of Subarea 4-11 west of the Highway #16 bridge at Galloway Rapids, which includes Wainwright Basin, Porpoise Harbour, and Porpoise Channel. Porpoise Harbour and Wainwright Basin Crab Closed Area That portion of Subarea 4-11 west of the Highway #16 bridge at Galloway Rapids, which includes Wainwright Basin, Porpoise Harbour, and Porpoise Channel. 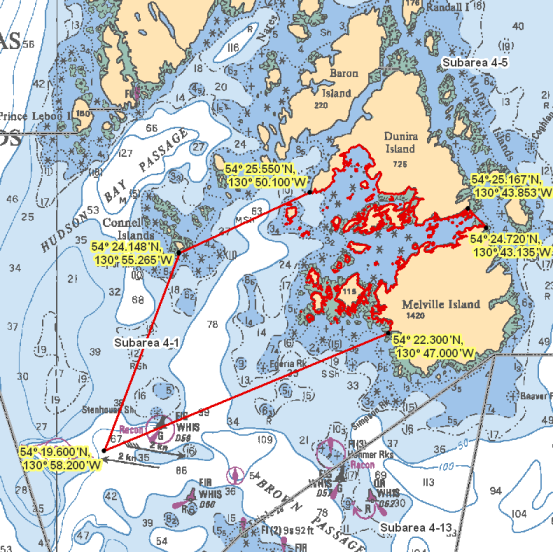 Herring 4,104 Reminder Harvesting of herring roe from marine plants or plants placed in the water for the purpose of harvesting herring roe is prohibited. Codfish 4,104 Reminder Species includes: Pacific cod, Pacific tomcod, pollock and hake but does not include lingcod. 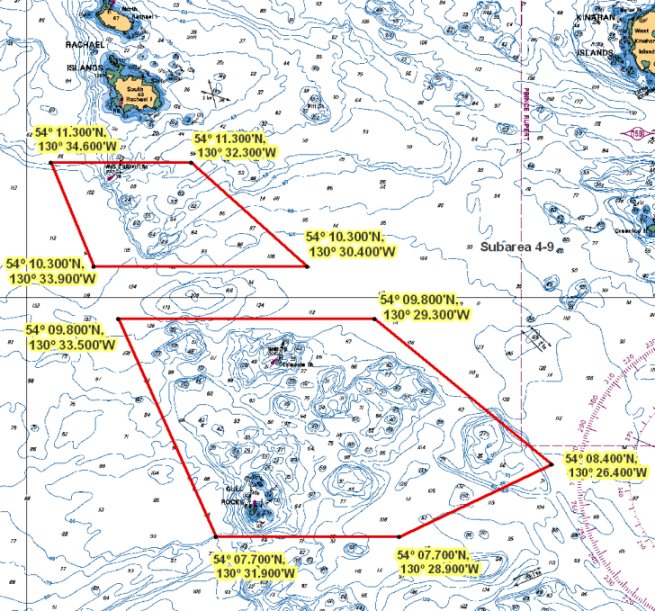 Dunira Dunira.png Those waters of Subarea 4-1 that lie inside a line that: begins at 54°24.148'N 130°55.265'W south tip of Connel Islands then to 54°25.550'N 130°50.100'W Farwest Point then following the southerly shoreline of Dunira Island to 54°25.167'N 130°43.853'W Dunira Island then to 54°24.720'N 130°43.135'W Melville Island then following the northerly shoreline of Melville Island to 54°22.300'N 130°47.000'W Melville Island then to 54°19.600'N 130°58.200'W in water then to the beginning point. Gull Rocks North Gull_Rocks_North.png Those waters of Subarea 4-9 that lie inside a line that: begins at 54°11.300'N 130°34.600'W in water then to 54°11.300'N 130°32.300'W in water then to 54°10.300'N 130°30.400'W in water then to 54°10.300'N 130°33.900'W in water then to the beginning point. Gull Rocks South Gull_Rocks_South.png Those waters of Subarea 4-9 that lie inside a line that: begins at 54°09.800'N 130°33.500'W in water then to 54°09.800'N 130°29.300'W in water then to 54°08.400'N 130°26.400'W in water then to 54°07.700'N 130°28.900'W in water then to 54°07.700'N 130°31.900'W in water then to the beginning point. 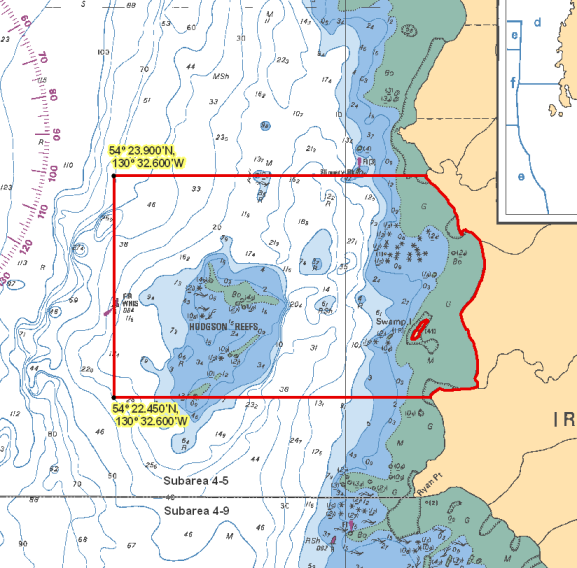 Hodgson Reefs Hodgson_Reefs.png Those waters of Subarea 4-5 that lie inside a line that: begins at 54°23.900'N 130°32.600'W in water then true east to the shore, then southerly following the shoreline to the intercept with the parallel passing through 54°22.450' north latitude, then to 54°22.450'N 130°32.600'W in water then to the beginning point. 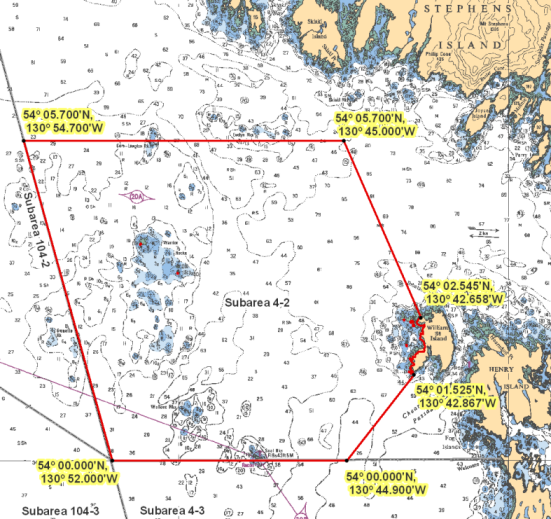 Stephens Island Stephens_Island.png Those waters of Subarea 4-2 that lie inside a line that: begins at 54°05.700'N 130°54.700'W in water then to 54°05.700'N 130°45.000'W in water then to 54°02.545'N 130°42.658'W north tip of William Island then to 54°01.525'N 130°42.867'W south tip of William Island then to 54°00.000'N 130°44.900'W in water then to 54°00.000'N 130°52.000'W in water then to the beginning point.